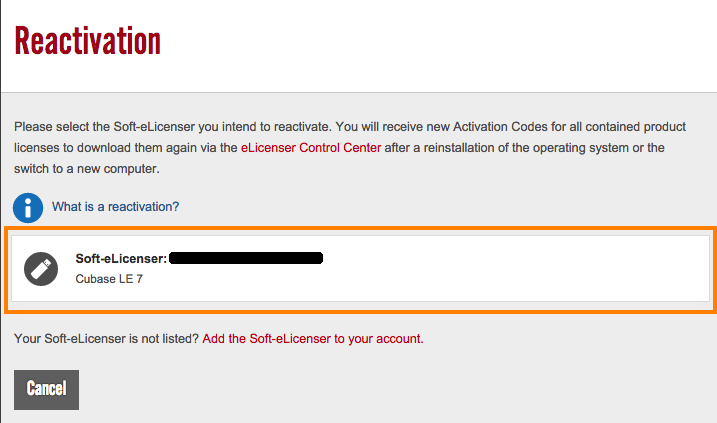 Cubase LE 6/7/8 activation codes may be used to activate the software on only one computer. Should you need to change computers/re-install your operating system, you will need to re-activate Cubase following these steps. 1. Log into your Steinberg.net account. 3. Select your old Soft eLicense from the list. 5. Next, in your Steinberg account go to Registration > choose the 20-digit Soft-eLicenser number and click on "Copy Serial Number". 6. Paste this new number into the corresponding field on the Steinberg site and then click 'Reactivate'. 7. You will then be issued with a new activation code for Cubase which you can enter in eLicenser Control Center by clicking 'Enter Activation Code'. 8. Cubase should now be re-activated on your computer.